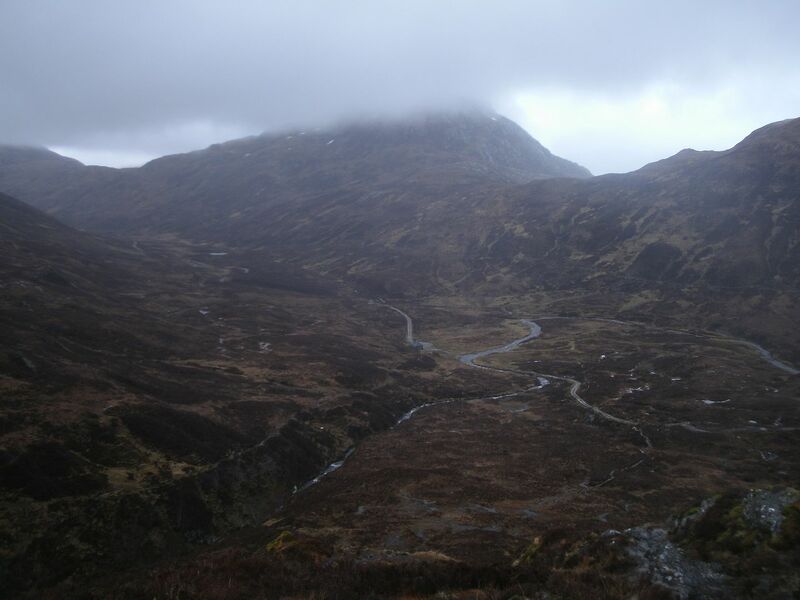 We both arrived a little early, and I let my Dad do the drive up to the car park up past Coirehoille where we were discouraged to even get out of the car, by the rain thundering down. 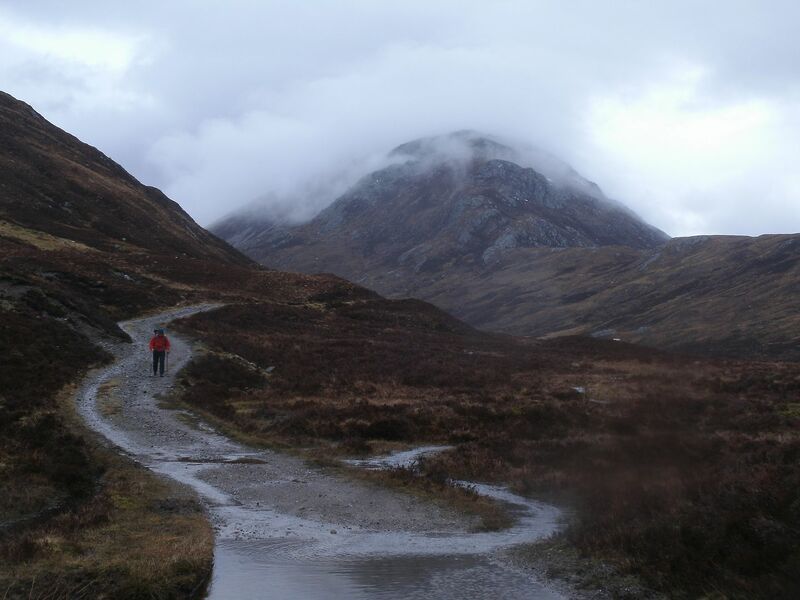 We did get up the motivation eventually, and started up the Lairig Leacach. 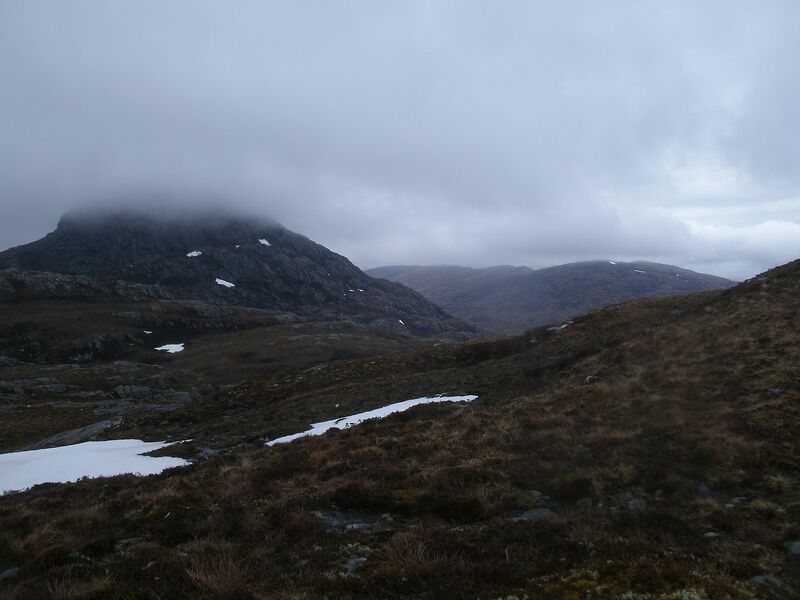 Its an easy walk, though the clag was right down, and it could have been any glen, anywhere.. We trudged on, heads down, and got to the bothy about midday, unpacked, and got the brew on. We were hungry, so had lunch and faffed.. before finally setting off again at about half 1. 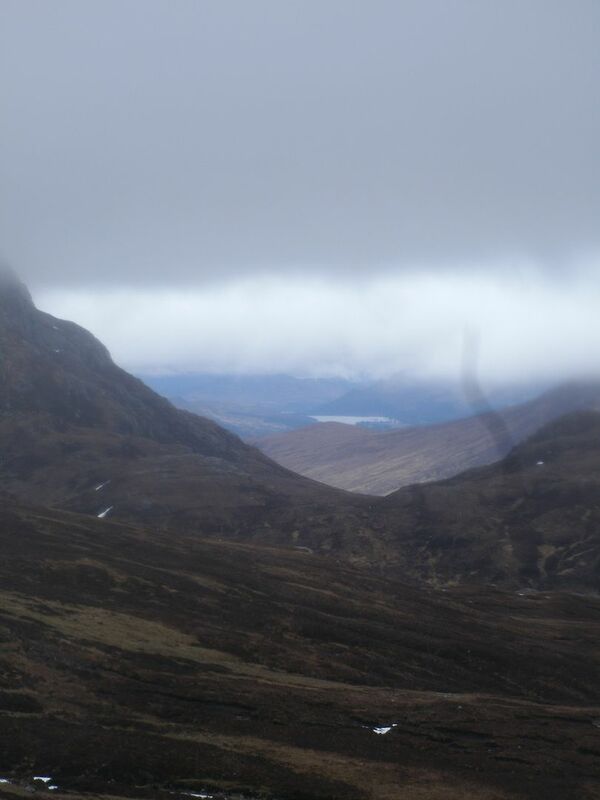 The weather was perking up, with the rain off and some gaps appearing in the clouds. I had been meaning to come up and do Stob Choires Easain and Mheadhoin for at least two years, so finally it was time to give it a bash. 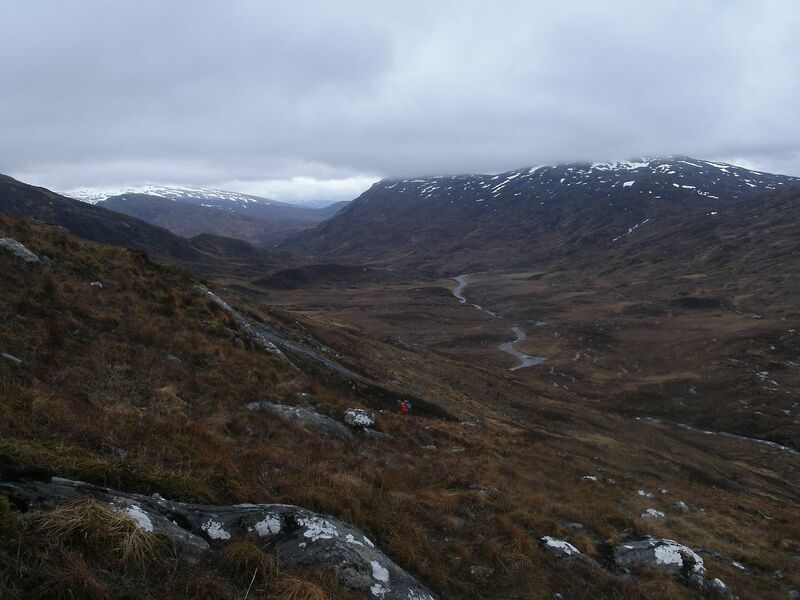 We headed more or less straight across the bog, heading for the path at the other side of the glen. 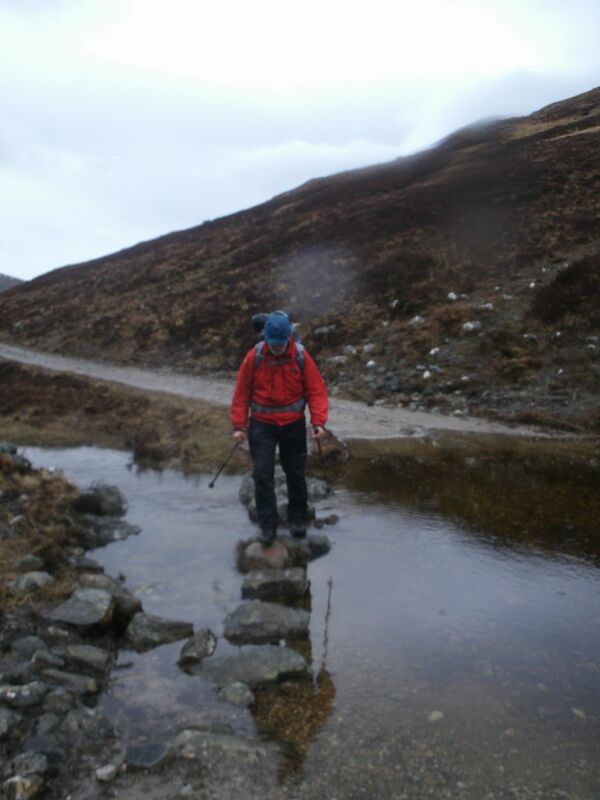 Made it across the stream without bother, and followed the rather dilapidated path for a while, looking for a break in the knee deep heather to give us a start up the hill. Like always, it was Hobsons. Heather was dry underfoot, but a lot of effort. 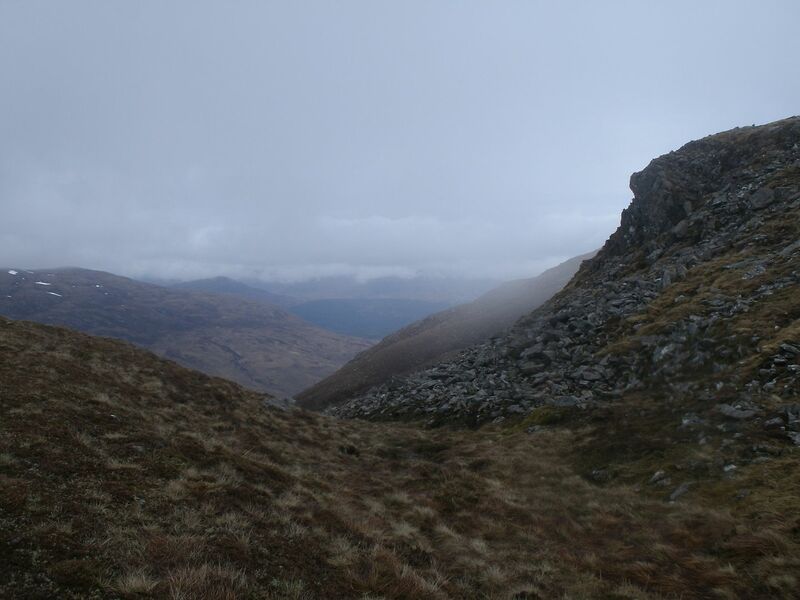 Clear patches were boggy, and a lot of effort but that part didn't last long as we traversed up to the ridge. What we could see of Sgurr Innse looked especially impressive, and we talked about coming back for it on another trip. We splooshed our way up to the ridge, where short, mossy heather and a stalkers path were our reward. The path came to an end abruptly in a wee gully, so we traversed round some steep stuff, the peak ahead coming in and out of the clag. Even the sun came out for a while, can't remember the last time I had such a defined shadow We were beginning to get up onto patchy snowy ground, and the surface was far from crisp, so a fair bit of effort. We scrambled over a rocky lip, and it was on to the the steep quartzite cone that caps this splendid mountain. 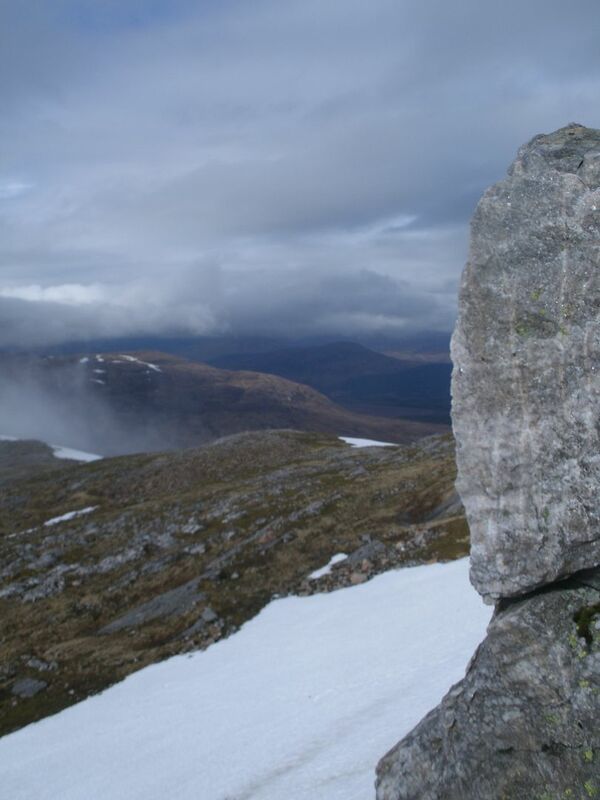 Another wee patch of snow, and we were slip sliding on scree. There was a path up this bit, but it was frequently buried under snow, and very close to the big cornice on our left, so we were forced to make the best of things - two steps forward, one slip back Dad had eaten a few too many shawarmas, or whatever they have in Lebanon on his hols and was really struggling, so I seemed to be stopped more than I was going, and I had to put more clothes on just to keep warm. 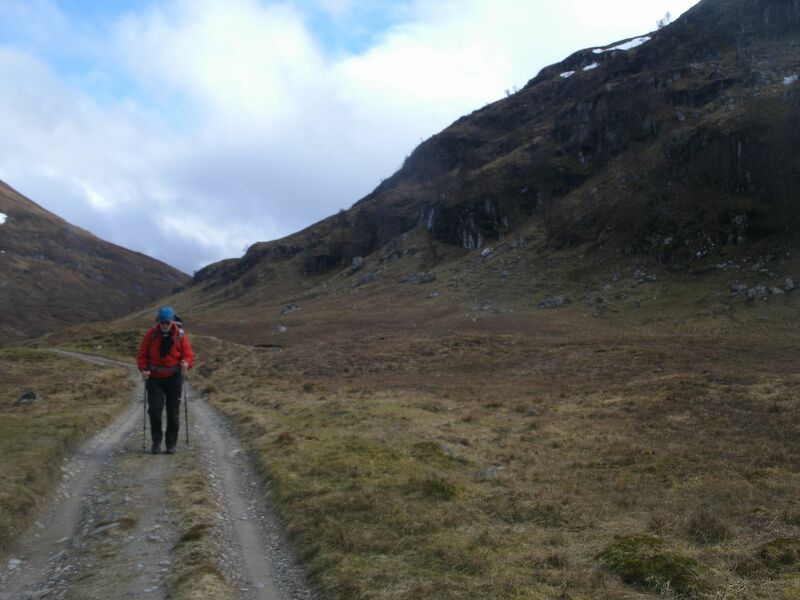 We got back on the path eventually, which zig-zagged pleasantly upward. 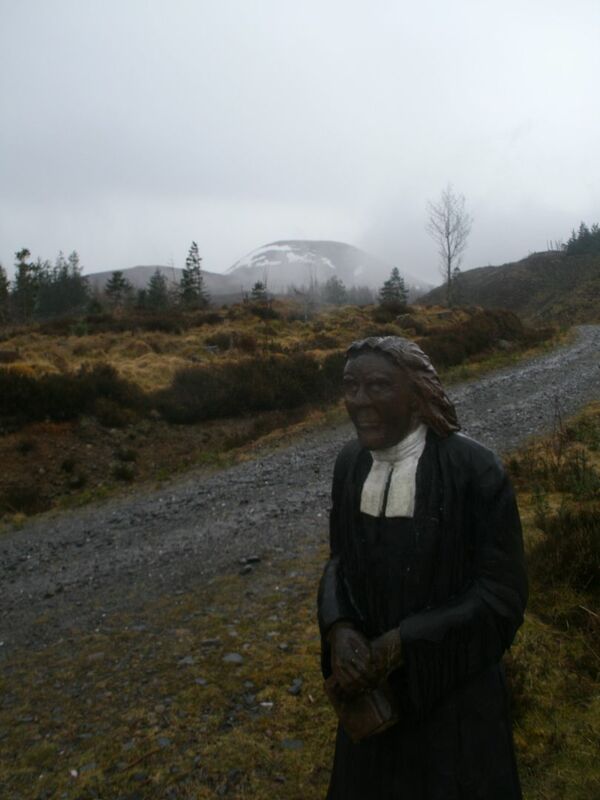 The clag came rolling in again, and when I got up to the snow, I was instantly confused as to which direction I was meant to be going as the clag meant it was like entering a white abyss. I figured as long as I felt like I was going upward, I was going in the right direction, and stopped every few steps to make sure I could still see Dad behind. Don't want to lose each other in this weather.. I suddenly felt like I was going downward, so checked my GPS to find I was at the summit, or very close. 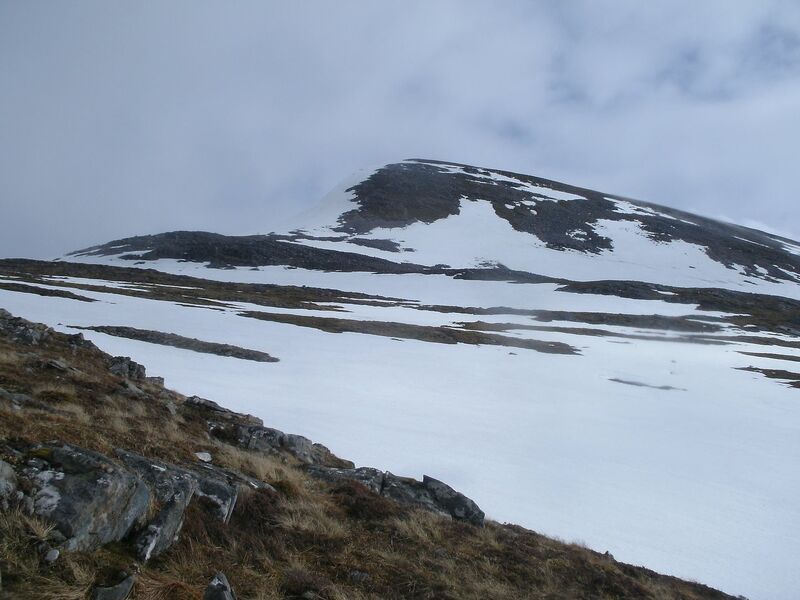 I waited for Dad to catch up and we wandered around the small plateau for a few minutes, but no signs of a cairn. 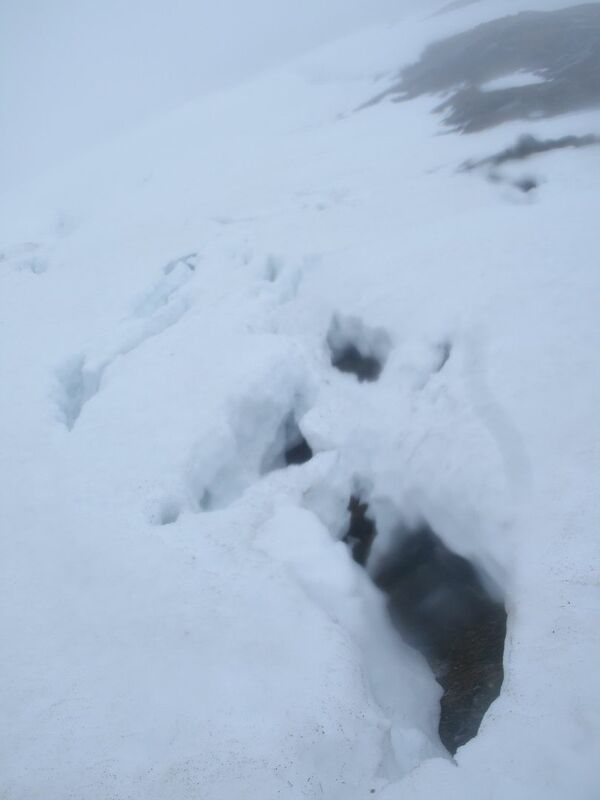 Our wanderings were not as comprehensive as I would of liked however, as there were multiple large, worrying cracks in the snow beneath our feet so it was very hard to tell if we were standing on a cornice or not. 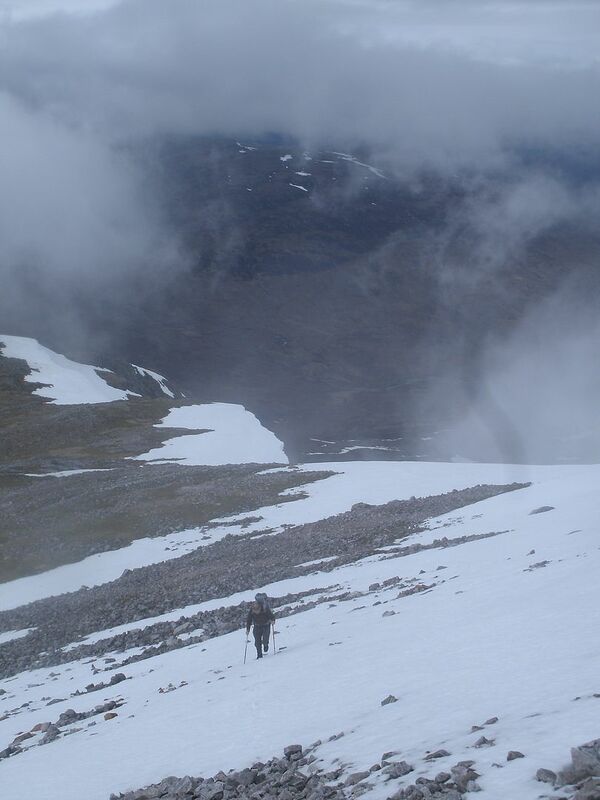 We gave up looking as we chilled, and set off for the second Munro of the day - Stob a Choire Mheadhoin. It was nerve racking stepping off the summit, with large drifts of sculpted snow masquerading as bigger obstacles than they actually were, but it wasn't far before we were back on solid ground, and a baggers path winding through the rocks, at times fairly precariously.. Down through the mists we went, getting hungry, and looking forward to our piece in the coll. It was pretty barren, but we found a rock further on for lunch. The climb the rest of the way up was really easy angled and fine underfoot. 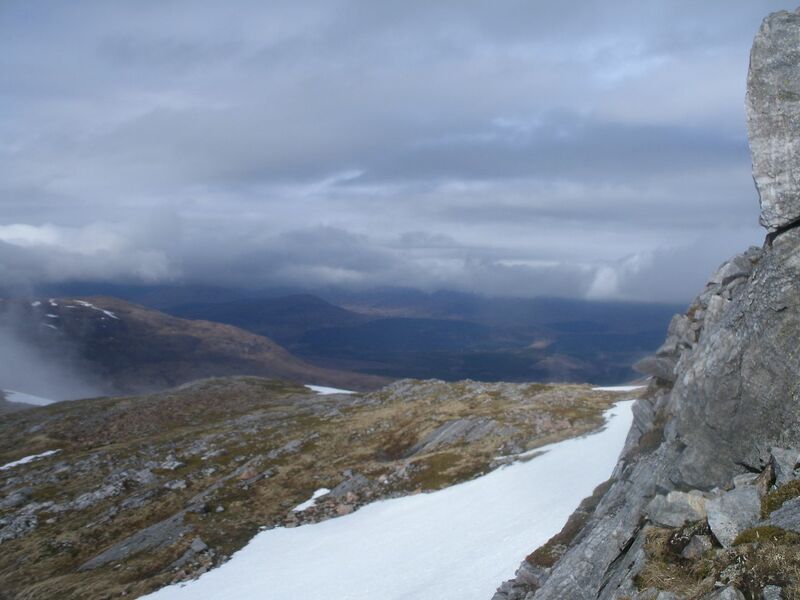 It suddenly cleared and we were above the clouds Shame very few other hills had managed to shed their clag, but I could see some of the Grey Corries, the Cairngorms a looooong way away, but most impressive of all, Stob Coire Easain, and it looked spectacular! Couldn't believe we had just been there. 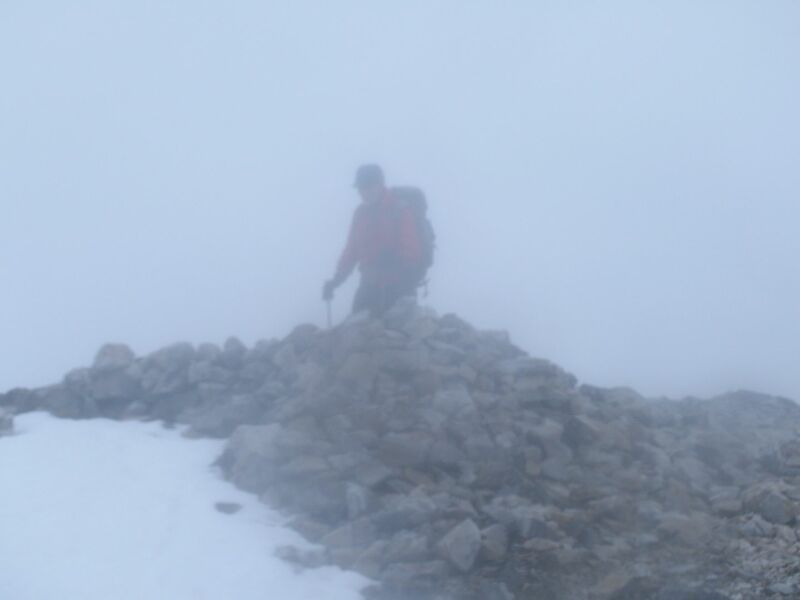 We got to the summit, the lack of snow up there was weird compared to the surrounding hills. So onward down the steep, slippery scree, we were glad to finally get down onto 'normal' ground below. We managed to avoid the scramble, and was surprised when Dad said it was after 7! No time for another stop, we took a very similar route down, this time following the ridge path until it petered out before slip sloshing down the bog back to the path. The bothy was temptingly close, but took an age to get there..
We were still all alone in the bothy, and we had litres of tea, a fine big dinner and a lot of chat before bed. A couple of hours later – about 1AM, we were joined in the bothy by a couple of Liverpudlians who had cycled up. I was too sleepy to do much conversing! We got back to the track, and before long we saw the path and were heading uphill. The path was little better than the open hillside, and we lost it for a while, but managed to spot it again, just before we headed the wrong way. We went up the crest, a few rocky bits slippery underfoot. 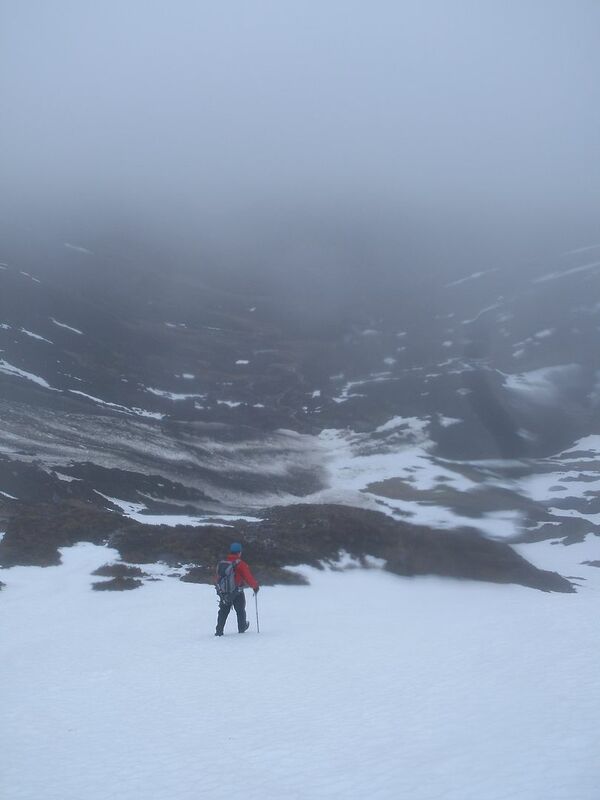 We were soon up in the clag, hitting snowy patches, we took turn to kick out steps. The rain was turning scotch misty, and the wind was getting stronger from our left, driving it in to every orifice in our clothing. It was getting less and less fun all the time.. Just an hour after leaving the bothy, we made the summit, looking like a pair of drowned rats, and feeling wetter than that..
and while there wasn't a cornice as such, the slope was very convex.. We went back up a ways, and traversed round, looking for a way down, which we did find. It was rather steep though, and I took it very slowly, my dad having to wait for me for a change Easier angled slopes were reached and it was fun taking giant steps down the snow, sinking to the thigh every now and then. We could see below where there had been a massive avalanche, with debris strewn over a huge area. When we got closer, the scale of Mother nature's hissy fit was awesome. 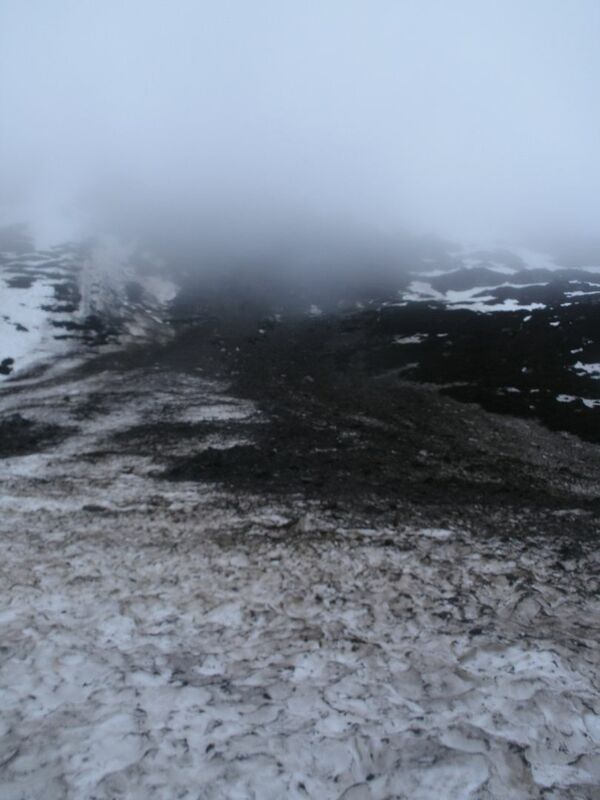 A huge chunk of the hill had been ripped clear away, with huge hunks of heather and enormous blocks of ice strewn everywhere. 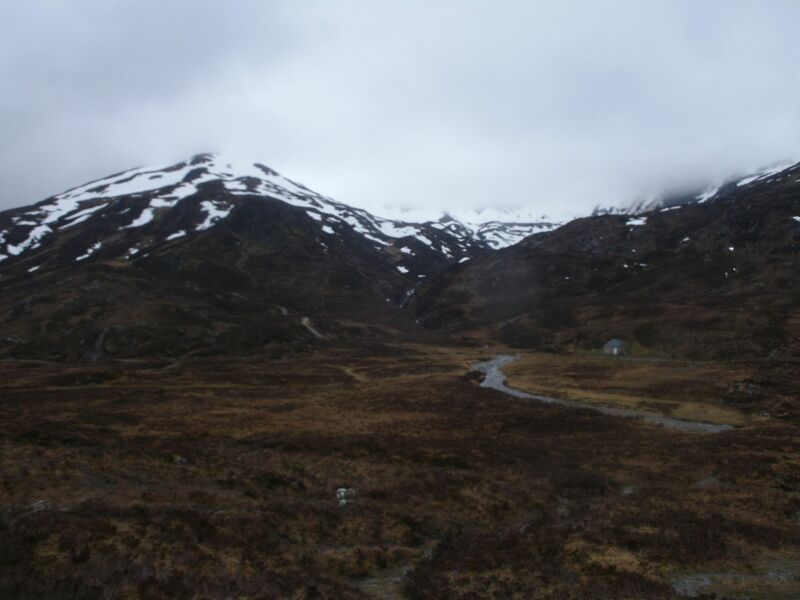 Dad said he had never seen the like in Scotland and it reminded him of glaciers he had walked in the Alps! 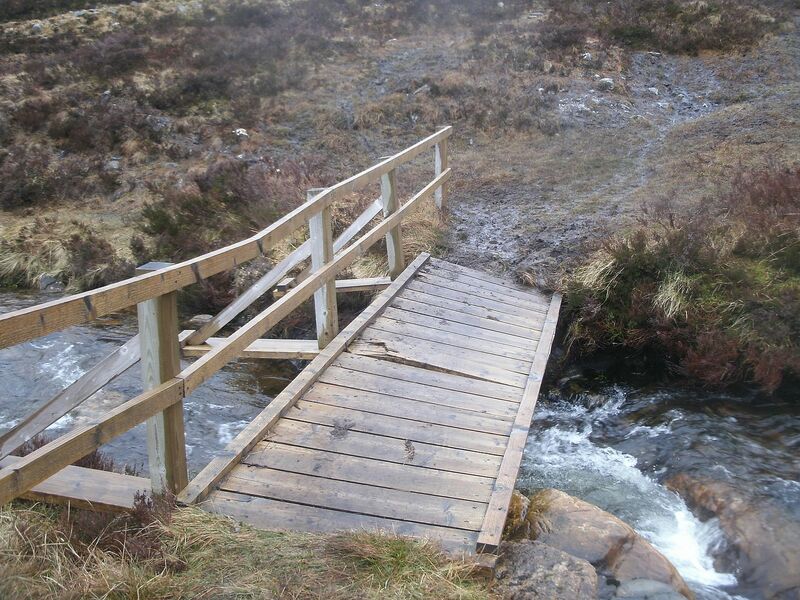 Once we were passed that, there was no more snow, and the path was a boggy mess.. Better making our own way across the hillside. 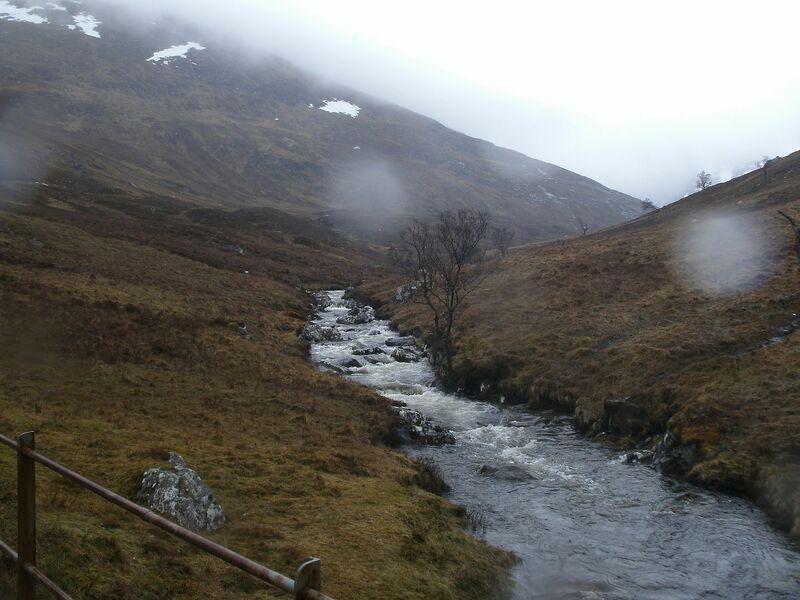 I tried to take photos of the bonny waterfalls we passed, but alas (as you can see )my camera had succumbed to the damp, only capable of steamy blurs Some good views over to Loch Laggan opened up once we were back below the mist. Wasn't far to the bothy thank goodness, where we found a couple of kindly loons drinking tea who had also done Stob Ban, and we had a good banter with them until they left. We made a brew, packed our things, and by the time we had finished the rain was almost off. 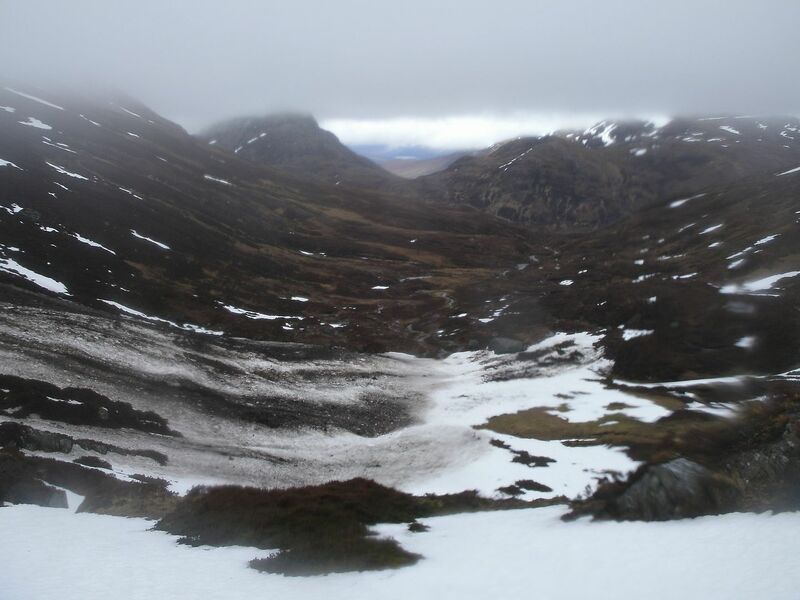 It was a rather nicer walk back down to the car, with the weather improving all the time, the waterfalls in spate with snow melt, and the clag clearing a bit to give us some fine views.